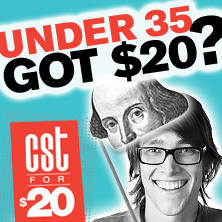 TIM DECKER CHICAGO SHAKESPEARE: Schiller’s Mary Stuart, The Comedy of Errors, Short Shakespeare! Romeo and Juliet. CHICAGO: City of Conversation (Northlight Theatre); Spill (TimeLine Theatre Company); stop. reset., Black Star Line (Goodman Theatre); Million Dollar Quartet (Apollo Theater Chicago); Toys in the Attic (Jeff Award, American Theatre Company); Ghetto (Famous Door Theatre); Mornings at Seven (Drury Lane Theatre); The Complete History of America (abridged) (Noble Fool Theatricals). FILM: Slice, Thrillride. TELEVISION: Chicago Justice, Chicago Fire (NBC); Empire (FOX); Boss (STARZ).